This is a free U.S. Money I have... Who has? 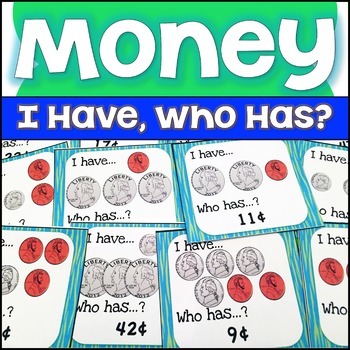 Game to help students learn to recognize money and count money $1 and under. This free money game features 42 cards in total (each card features a different sum of money). CC.2.MD.8 - Solve word problems involving dollar bills, quarters, dimes, nickels, and pennies, using $ and ¢ symbols appropriately. Example: If you have 2 dimes and 3 pennies, how many cents do you have? * Type this number: 792, if you are not a robot.